India Area Rugs are Works of Art that Bring Warmth Into a home! India Area Rugs add beauty and elegance to a home and they are found in homes all over India. Indian rugs are a part of the tradition and art culture of India. My wife and I love Indian rugs, so when we were in India for our wedding, we visited the homes of many family members and noticed they all had beautiful wool rugs. We instantly knew we needed to bring home rugs from India to our home in the United States. Rugs from India each tell a story about India's culture. Take a look below and see what I mean. India area rugs take weeks and weeks to tuft together. The amazing colors represent the vibrant lifestyle of India and the way that the people of India live today. This is because India has such a colorful history. It's easy to see that pieces of art, like rugs, have a lot of heart and pride skillfully placed into them. 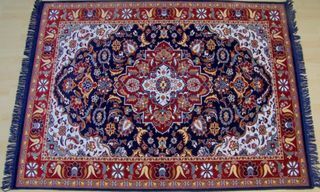 Rugs are typically woven and tufted in small shops where dedicated artists devote their lives to rugs' creation. 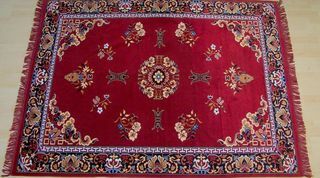 It's difficult for people in the United States to find authentic rugs from India for less than a small fortune. This is because we normally only see rugs from India that are meant to be sold to westerners for a substantial profit. We don't normally see the rugs that Indian people have in their homes. This beautiful Hand-Made Wool Blend Rug from India displays gorgeous color on a background of deep blue. 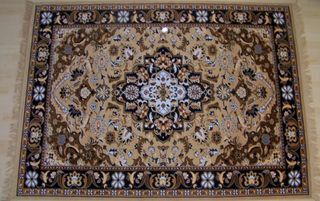 This beautiful Hand-Made Wool Blend Rug from India displays gorgeous intricate design on a tan background. This beautiful Hand-Made Wool Blend Rug from India displays breath-taking bright designs on a red background. 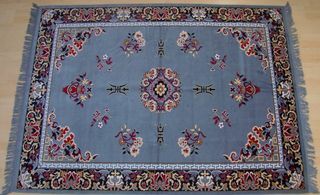 This fantastic Hand-Made Wool Blend Rug from India displays traditional designs on a light-blue background. This fantastic Hand-Made Wool Blend Rug from India displays traditional designs on a tan background. 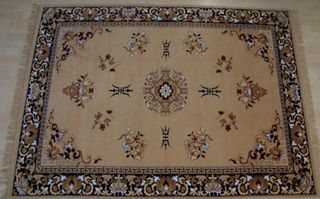 Leave India Area Rugs to discover the culture of India. Find out what it's like in India today. Discover more of India from our homepage.